Apartment located on championship golf course overlooking the sixth green on the first floor with two balconies, one facing east and one facing west so you can have the maximum use of the apartment for the sun. Overlooks the Atlantic Ocean from the balconies and is handy for bars, meals, swimming pools etc. A safe is available in the apartment for your extra security. The TV receives BBC1, BBC2, ITV, Sports Channels and various Spanish channels. The airport is only 10 minutes by car and the popular tourist attractions of Los Cristianos and Playa de Las Americas are 20 minutes away. Sightseeing trips can be booked nearby. Wifi access is now available. About Tenerife: Tenerife enjoys year round sun and is thus the ideal location for a relaxing holiday any time of the year. A number of swimming pools in the resort can be used. Spent 12 days over Christmas and the New Year. The apartment had everything we needed to have a relaxing holiday in the sunshine. 2 balconies gave us all day sunshine. Having sun loungers meant we could make the most of this as the nearest beach is not suitable for sunbathing as very rocky and this complexs own pool was shut - although we had the opportunity to use the pool at the nearby Scorpio complex there were not enough sun beds there. The apartment was spacious and clean. Comfortable beds and sofa. Some basic cooking ingredients were left in the kitchen but there was a handy supermarket nearby. Water and milk had been kindly left in the fridge for us. Some of the electric sockets were a bit loose and we could not use these but there were enough to get by. Nearby there are a few bars with entertainment and some good restaurants. The noise from the terrace bar could be heard in the bedroom but this stopped at 12 pm so not a big issue. Would like to have booked for next Xmas but the owner not sure about their future plans so have booked into the Fairways complex across the road which has the advantage of a good pool area. Apartment clean & all you needed. Enjoyed our 1 week at the apt. nice to have 2 balconies for morning & then afternoon sun. Would stay here again, neighbours friendly. Comfy clean and well equipped. Great location and twin balconies give sun at all times of day. Quiet relaxing spot with pool nearby. As is usual with properties in Tenerife we were for a time infested with tiny ants at one time I had so many on me I thought I'd been nominated for a bush tucker trial, but a visit to the shop for some spray soon put a stop to them. Thank you for your comments. Unfortunately as you say ants are a regular problem in Tenerife. We can go for months without any then have a problems. Our cleaners do try to keep them under control the best they can. I will agree the kitchen is looking a little tired now and have it on the list to review and hopefully change. May have been done this year except for some emergency work that had to be done in the bathroom and one of our tenants taking the keys, necessitating us to change all the locks !! Golf: Amarilla Golf is a par 72 course designed by Donald Steel in 1990 and was home to the Tenerife Open in the same year organised as part of the P.G.A. European Tour. It is an extensive link-typed golf course having spectacular seaside views and the majority of its holes border, or are placed across, the sea. 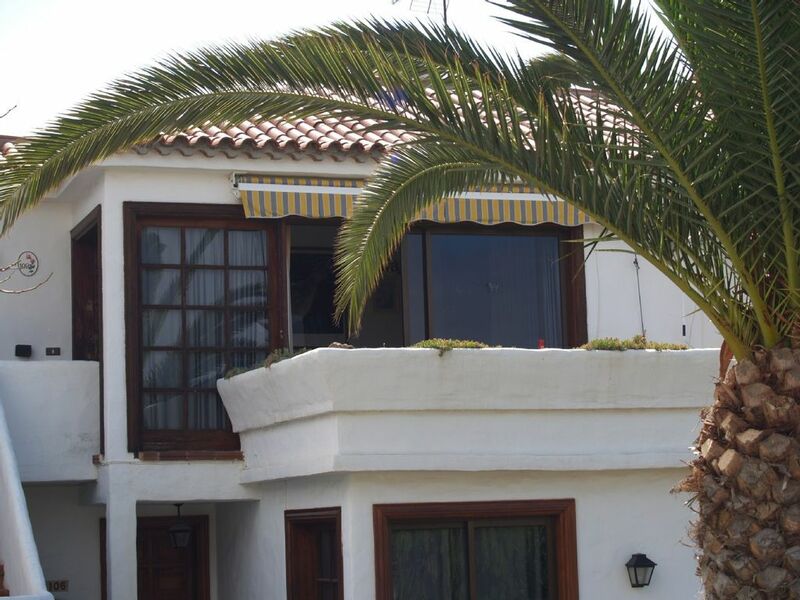 It is also a short distance away from Golf del Sur which also boasts two more courses. Paypal accepted (2% surcharge). Discounts may be available for bookings of more than 14 days.